Steven Weiss began blowing harmonica when he was four years old. His father and grandfather both played the mouth organ as well. Growing up in the more popular cross-harp rock/blues/boogies styles, he began playing straight harp (melodies rather than chords or blues)- traditional, mostly old-timey, tunes on the harmonica in 1970, hanging out with southern tow boat pilots on the Ohio River near where he went to college. This was followed by many years living in Maine playing for contradances, folk clubs, concerts, festivals and playing back-up for other performers. Although he is best known for his playing of fiddle tunes and traditional music (he has actually won fiddle and traditional music contests playing on the harmonica), he loves pushing the instrument’s envelope in accompaniment, rhythmic blues, jazz and old swing standards, exploring (and teaching) at least four positions of the harmonica (yep – there are actually at least four different keys one can play in on a harmonica!). Recently, he has been emerging musically a bit more from his long-time “day job” as an osteopathic physician/healer/teacher/writer. 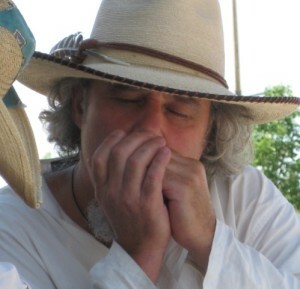 Steven has begun to play out more in several bands (ranging from boogie/funk/blues to fiddle music and jazz)… and teach again more actively, bringing his unique joyous approach to the harmonica. He teaches private lessons in both harmonica and jew’s harp. Best of all, if you hurt yourself on the dance floor or lugging around your instrument, he can probably do stuff to help heal you as well! For the Maine Fiddle Camp Classes he relies primarily upon diatonic, Richter tuned, 10-hole harmonicas in the keys of D major and G major. If you don’t have these, you can buy excellent, deeply discounted instruments from Steven at the fiddlecamp.